Bikram Yoga Chadds Ford is pleased to announce the completion of its first “30-day challenge” since opening in February of this year. Megan Lynch van Riet and Healther Dunghe, co-owners of the studio, posed this challenge to the residents of Southeastern Pennsylvania and Delaware: “Give us 30 days; we’ll change your life!” The challenge was to attend 30 Bikram Yoga classes at the Chadds Ford studio in 30 days, starting April 9th and ending May 8th, 2012. Certainly a challenge of this type would require dedication, willpower and time, but if a student was willing to commit, the studio owners promised that Bikram Yoga would change their bodies, minds and lives, in just 30 days. With 15 students up for the challenge, Van Riet and Dunghe (with the help of instructors Carolyn Jensen, Chris Robin and Chris Fluck) taught 90-minute daily practices of 26 postures and two breathing exercises in a 105-degree room. New students, seasoned practitioners and the 30-day challengers alike joined together to sweat it out in search of stress relief, weight loss and a greater sense of mental and physical well-being. As the challenge proceeded, the students started to see how Bikram Yoga differs from other types of yoga as well as other forms of exercise. Regular practice of Bikram Yoga will strengthen your spinal and core muscles, and will help alleviate health ailments by providing relief and control over symptoms (e.g. pain). Bikram Yoga is also and excellent cardiovascular workout without high impact and stress on joints, making it accessible for everyone and every body. As the challenge continued, each day seemed to bring more self-confidence to the students. Friendships and alliances started to develop and the challengers felt they were supported and nurtured every step of the way. “Bikram Yoga Chadds Ford has become a new family” says practitioner Meredith Williams who completed the 30-day challenge with her mother Margie. This level of confidence and strength gave a number of students the guts to take a “double” class (two classes in a row or two classes on the same day), which most practitioners haven’t even thought of attempting, at least not in their first 30 days of practice! Upon completion the resounding comment from the challengers was that it was in fact a life-changing 30 days. Margie Williams, age 58, felt this challenge gave her so much. It not only allowed her to develop a great level of confidence that transcends into her professional and personal life, but it gave her the opportunity to get to know her adult daughter on a new level, which she cherishes. Margie says this is only the beginning of her practice. Other challengers commented on how the challenge evolved over 30 days. The biggest challenge was mental says challenger Devon. The first week was about learning to believe in yourself and seeing that you could do more than you think you are capable of doing. The second week brought some physical challenges sore muscles surely indicated that something physical was beginning to happen. By week three, many of the challengers started to see weight loss and muscle development, which felt great and gave them the encouragement to continue on to the end of the challenge. Once immersed in the practice, it was the discipline of 26 postures that kept me coming back, says challenger Michelle. Doing the same practice daily allows you to see how you improve and where you need to work harder. A number of challengers are continuing on with the goal of completing 60 classes in 60 days. Others plan to develop a regular practice of 4-5 classes per week and see Bikram Yoga Chadds Ford as a central part of their exercise program. Deni-Lyn is continuing on, with hopes of completing 60 classes in 60 days. Vasanthi, a regular practitioner, completed the Broad Street Run on May 6th, just two days before the end of the challenge. 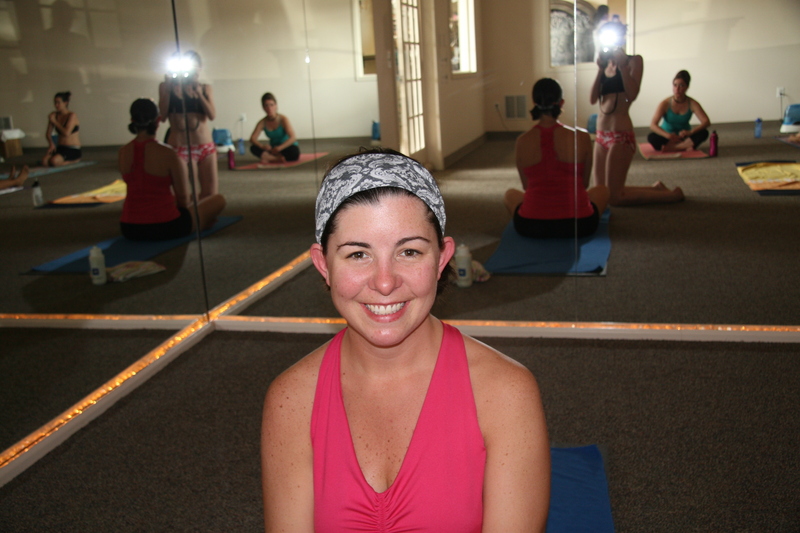 She felt great during the run and felt that her time was vastly improved because of her regular Bikram Yoga practice. Vasanthi intends to complete her first marathon this September with Bikram Yoga as an essential part of her training. Bikram Yoga Chadds Ford is very proud of the efforts made by their students and looks forward to helping change the lives of those in their community. ← Yoga: Your healthcare system.